As the squad photograph for the 1961/62 season has not yet been uncovered, we instead have the line-ups from the 2-1 victory over Crewe Alexandra at St. James Park, on the 9th September 1961. 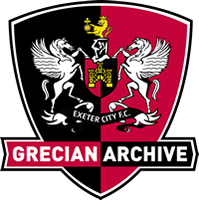 The Grecians finished in the bottom half of Division Four in this season, placing 18th. Exeter did not have much luck in the cup either, exiting both the FA Cup and League Cup at the first time of asking. First Round: Dartford (H), 3-3. Replay (A), 2-1. First Round: Mansfield Town (A), 5-2.